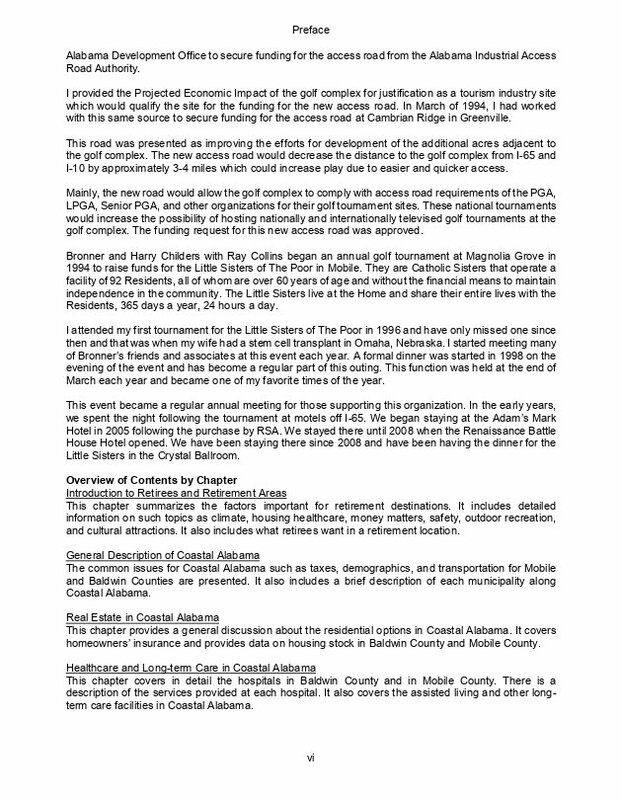 Mark Fagan spent five years researching Baldwin County and Mobile County for the Coastal Alabama Retirement Guide. 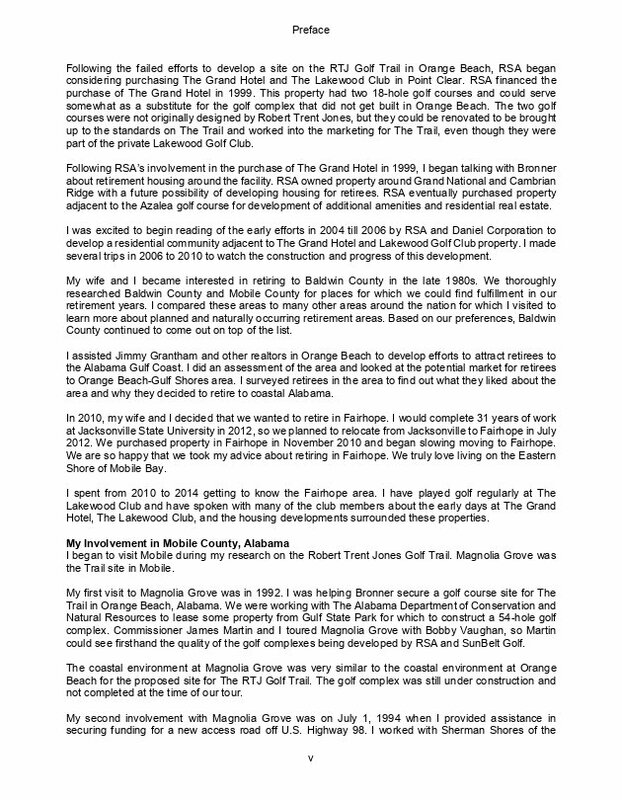 He has experienced retirement life in Coastal Alabama and now wants to share his story of retirement in this area. He visited the attractions and took almost all of the photos. The photos are intended to give the image of experiencing the attractions of Coastal Alabama. This book summarizes the factors important for retirement destinations and includes detailed information on such topics as climate, housing, healthcare, long-term care, money matters, safety, outdoor recreation, cultural attractions, and festivals for Coastal Alabama. 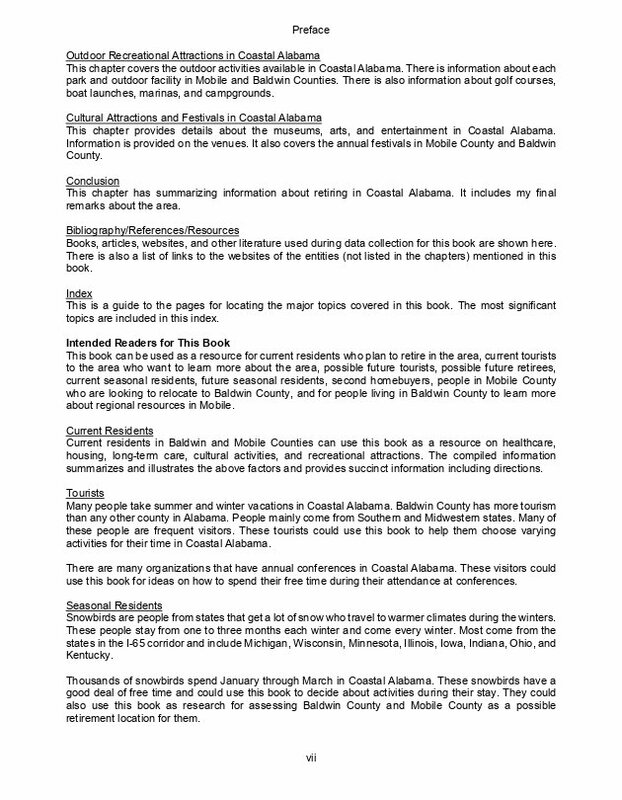 It includes a general description of Coastal Alabama including a brief description of each municipality. This book can be used as a resource for current residents who plan to retire in the area, current tourists to the area who want to learn more about the area, possible future tourists, possible future retirees, current seasonal residents, future seasonal residents, second homebuyers, people in Mobile County who are looking to relocate to Baldwin County, and for people living in Baldwin County to learn more about regional resources in Mobile. So, this book gives the author's thoughts about retiring in Coastal Alabama based on his 34 years of researching retirees and retirement communities. It includes all the details necessary to follow-up on the information in this book. This book provides answers to the questions of would I enjoy retirement in Coastal Alabama and how can I enhance my retirement experience in Coastal Alabama. This book provides a summary of the factors important for retirement destinations. Below is the Table of Contents. 1. Introduction to Retirees and Retirement Areas. This includes information on climate, housing, healthcare, money matters, safety, outdoor recreation, and cultural attractions. It includes what retirees want in a retirement location. 2. 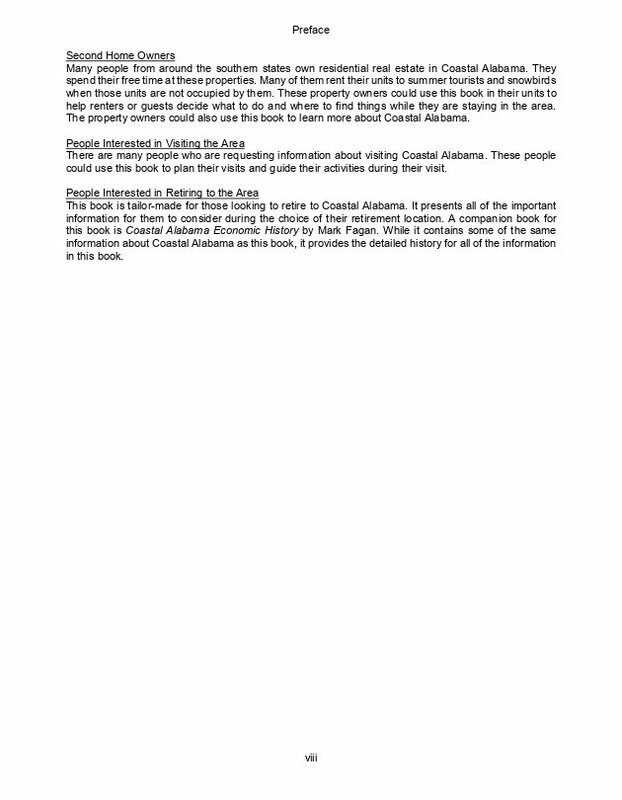 Basic Information About Coastal Alabama. This provides a description of each municipality. The common issues such as taxes, demographics, and transportation for Mobile and Baldwin Counties are discussed. 3. Real Estate in Coastal Alabama. This includes residential options and covers homeowners' insurance and existing housing stock. 4. Healthcare and Long-term Care in Coastal Alabama. This has details about the hospitals with a description of the services at each hospital. It covers the assisted living and other long-term care facilities. 5. Outdoor Recreational Attractions in Coastal Alabama. This covers the outdoor activities with information about each park and outdoor facility as well as golf courses, boat launches, marinas, and campgrounds. 6. Cultural Attractions and Festivals in Coastal Alabama. This includes details about the museums, arts, and entertainment in Coastal Alabama. Information is provided on the venues and the annual festivals. Current residents in Baldwin and Mobile counties can use this book as a resource on healthcare, housing, long-term care, cultural activities, and recreational attractions. The compiled information summarizes the above factors and provides succinct information including directions and photos. Tourists and snowbirds who spend their summer or winter vacations in Coastal Alabama could use this book to help them choose varying activities for their time. There are many organizations that have annual conferences in Coastal Alabama. These visitors could use this book for ideas on how to spend their free time during their attendance at conferences. These people could use this book to plan their visits and guide their activities during their visit. Seasonal residents stay from one to three months each winter in Coastal Alabama. They could use this book as research for assessing Baldwin County and Mobile County as a possible retirement location for them. Many people own second homes in Coastal Alabama and spend free time at these properties. These property owners could use this book to learn more about Coastal Alabama. This book is tailor-made for those interested in retiring to Coastal Alabama. It presents all of the important information for them to consider during the choice of their retirement location. Mark Fagan earned his doctorate in Social Policy, Planning, and Administration at The University of Alabama in 1981. He is Department Head Emeritus at Jacksonville State University in Alabama where he taught from 1981-2014. He has researched retiree migration and retirement communities for 32 years. 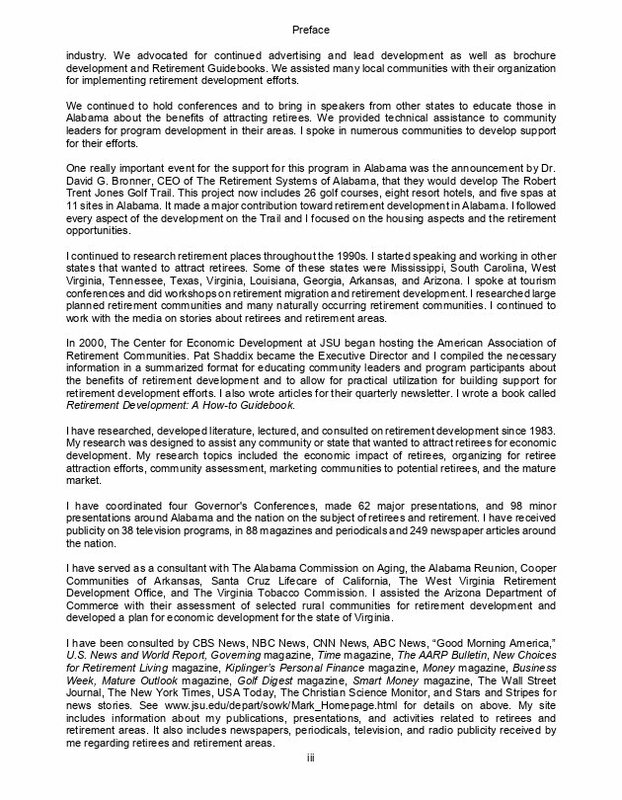 He is also the author of Attracting Retirees for Economic Development; Retirement Development: A How-To Guidebook; The Robert Trent Jones Golf Trail: Its History and Economic Impact with a Foreword by David G. Bronner; Coastal Alabama Economic History, and Alabama's Public Pension Fund Growth and Economic Expansion Since 1973. Click here for more information about Fagan's other books along with photos and videos. 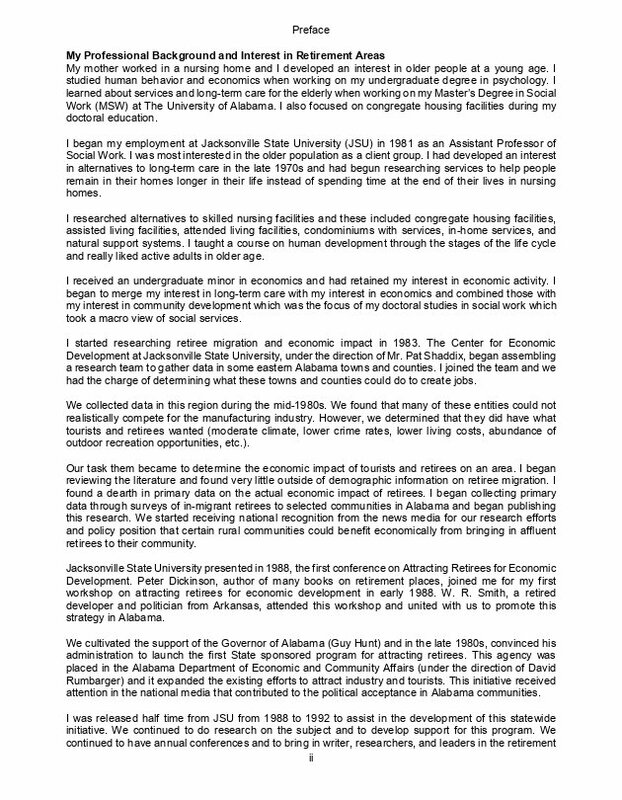 While at JSU, he worked half-time from 1988 to 1992 as a program developer for the Alabama Program to Attract Retirees. 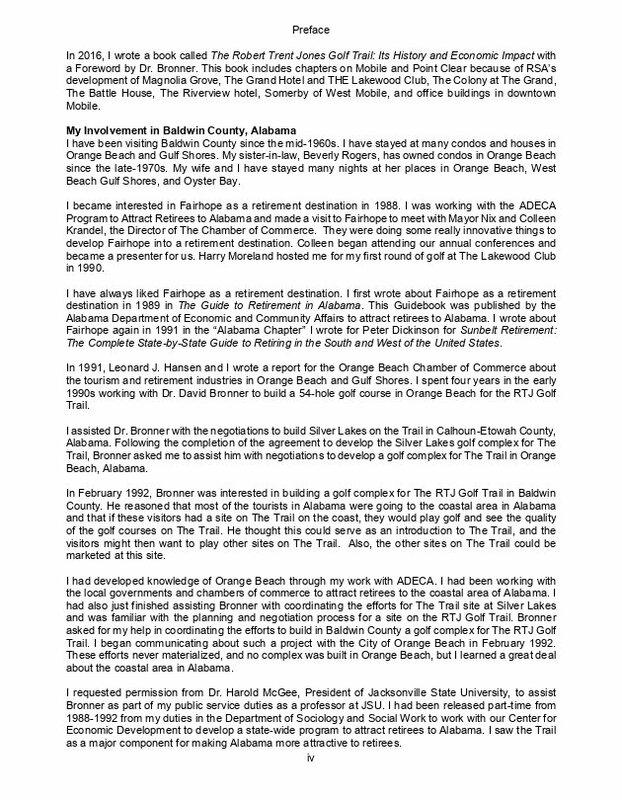 He assisted The Retirement Systems of Alabama on various aspects for the development of the Robert Trent Jones Golf Trail for the last 25 years. His work on the economic impact of retirees was cited as a contribution toward the conceptualization of the Trail. He was intimately involved in the negotiations for three sites; did projected economic impact analyses for five sites; provided the justification for four sites for access road funding; assisted with the housing components around three sites; and has written 17 articles about the Trail that were published in some form. Most of his 134 publications, media articles, and technical writings since 1981 have focused on the economic impact of retirees and retirement communities. He has coordinated 4 Governor's Conferences, made 57 major presentations and 96 minor presentations around Alabama and the nation about retirees and program development to attract retirees. He has been a consultant to Virginia, West Virginia, Mississippi, Arkansas, and Arizona concerning the attraction of retirees for economic development. Click here for detailed information about Fagan's publications, presentations, and publicity received. In 2016, he presented at the HSBC (Hong Kong-Shanghai Banking Corporation) 13th Annual World Golf Business Forum where attendees from the far east, middle east, Europe, Africa, and South America heard Fagan discuss the use of pension funds to finance golf courses. He has been consulted by The Golf Channel, CBS News, NBC News, CNN News, ABC News: "Good Morning America," The AARP Bulletin, Time, Governing, U.S. News and World Report, New Choices for Retirement Living, Kiplinger Personal Finance, Money, Business Week, Golf Digest, Smart Money, The Wall Street Journal, The New York Times, USA Today, The Washington Post, The Christian Science Monitor, and National Public Radio for news stories on retirement. He has been quoted and appeared in the following media concerning retirement and retirees: 34 television programs (including The Golf Channel), 248 newspaper articles, and 86 magazines and periodicals. He has visited and lived in Coastal Alabama for 50 years. He retired to Baldwin County in 2012 and has been writing books and researching Coastal Alabama since then.